Marketing managers are pressed to drive leads through well-crafted campaigns that seem to never end. Just when one initiative is complete, there are more lined up in the pipeline. While budgets and timelines are top of mind, tracking them can sometimes pose a challenge, particularly since so much is dependent on other people, such as consultants, creative resources and developers. Spreadsheets are typically used to somehow manage all of the chaos, but not very effectively, and offer little in way of reporting. Marketing managers are doing the best they can with the marketing automation tools and website analytics they have but they still lack a solution that is the one system of record. What they really need is visibility into the status and details of each campaign ensure campaigns are being executed properly and reports accurately reflect how well the campaigns have fared. Without it, they may feel like they are riding a fast-moving train that never stops. It’s go, go, go all of the time and it’s exhausting. 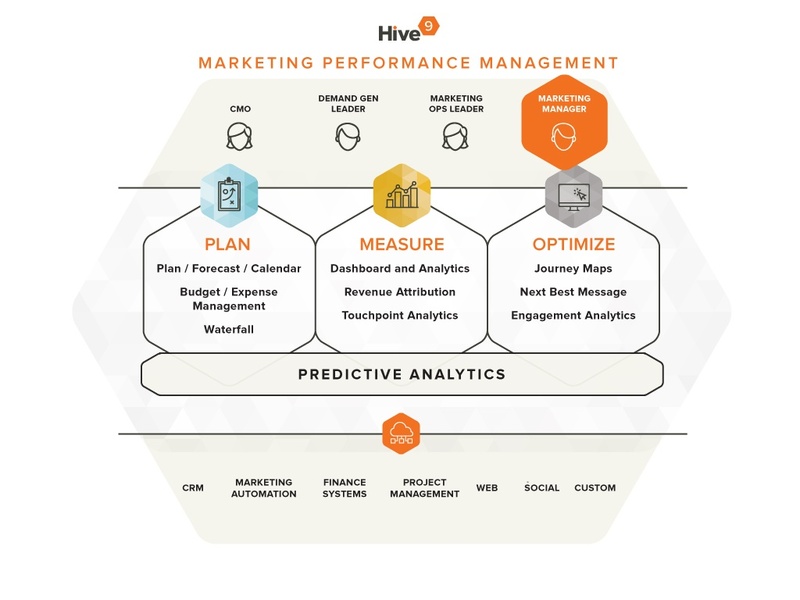 Hive9 is the perfect marketing performance management solution to bring order to the dynamic and fast-paced world of B2B marketing. Our cloud-based software is easy to use and gives marketing managers the ability to plan campaigns, estimate costs and expected results, then get one view of all of their campaigns and budgets in real-time so everything can be tracked, measured and controlled. We make this possible through easy campaign set-up and dashboards that give you an instant snapshot view of which campaigns are generating which leads and how many so you can report on their effectiveness. If you’re ready to work from a single solution that gives you some control and actually makes your job easier, it’s time you look at Hive9.